The movement is changing how we think about education, our relationship with technology and the underlying way we understand the world. The next chapter of our Digital Transformation introduces us to the Maker Movement. This movement is not just an Edge-ifcation view of evolving thoughts but a view of the edge of social change. 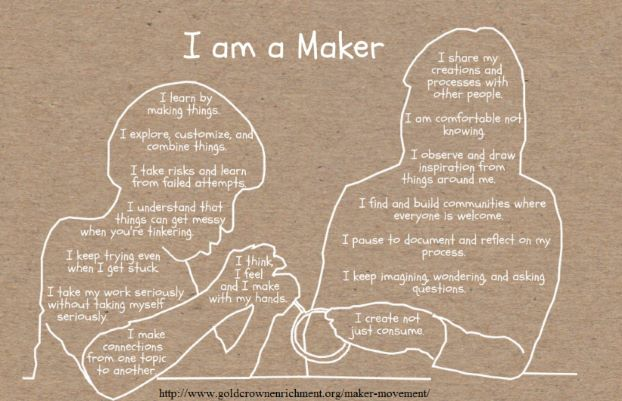 The Maker Movement is a mindset; one that typifies the wonders of the 21st century while giving us hope that the turbulent times we’re currently living through may just be the growing pains of a more sharing, honest and productive society to come. The movement is changing how we think about education, our relationship with technology and the underlying way we understand the world. The power of ‘I’ is being replaced by the power of ‘we’ as people wake up to the fact that not only can they achieve more themselves, but that together, anything is possible. Yes, changing how we think about education such as in the chapter on Edge-You-Cation in which we combine autodidact with traditional learning methods. An autodidact is someone who critically and willingly seeks out knowledge. Autodidacticism is by definition the informal, private, self-teaching process during which the self-educator gathers, processes, absorbs, and uses new knowledge. From one of my dated editorials Becoming an Autodidactic Asset The process of coming to be a self-taught person who is a valuable thing. I started several months ago with the realization that our greatest assets as an industry are our people, this leads me to the conclusion that we needed to grow our industry by dragging young IoT savvy folks across the skills gap. During this journey, I discovered that our lead industry assets badly need to become autodidactic, bridging their skills gap about IoT and its savvy folks. This includes being part of all the social media interactions that they are now not part of, to learn more about how these young folks think and interact. Ironically the skills gap is widened by our (yes us old guys) lack of evolving skills; always in teaching it is the teacher that is taught. I grew in the industry as an autodidact during the Direct Digital Control - DDC Revolution from student to consultant and am now growing old documenting the edge-ifcation of our industry. The problem with new technologies is there is no formal path for learning because the technology has not yet been defined. Even the roles of the practitioners are up for grabs. Such was my entrance into the industry. Coming from the traditional control industry, I collided with the newly created microprocessor industry my autodidact approach to understand this collision lead me from student to consultant very rapidly because of the maker movement of the time, we were able to do with software and microprocessors what had been only done by physical devices before as with all new technologies "we were magic" achieving solutions not ever achieved, it was the best of times. Today's edge-ifcation of the maker movement is a renaissance of this time. Many people have heard of the Maker Movement, but some may not know how far the movement has spread. The Maker Movement started gaining traction in 2005 but has been around forever as it is simply comprised of people who “make.” It became what we now know as the Maker Movement as more and more people became “do-it-yourselfers.” Fueled by new technologies and innovations, the movement is spreading like wild fire across the nation, resulting in Maker Education, Maker Spaces, and Maker Faires. How and where does Edge-ifcation Meets Maker Movement? They have low-cost computing devices like Arduino and Raspberry Pi as well as affordable sensors (accelerometers, gyroscopes, magnetometers, GPS, temperature, etc.). Like kids set loose in a roomful of legos, IoT product developers around the world are making brand new things to connect to the Internet out of smartphone components and open source software stacks. Makers are taking advantage of the supply chain built by the mobile computing industry. They have low-cost computing devices like Arduino and Raspberry Pi as well as affordable sensors (accelerometers, gyroscopes, magnetometers, GPS, temperature, etc.) at their disposal. Open source organizations and big tech companies are trying to harness Maker Movement power by sponsoring hackathons, contests, and test bed sites. Even the US Department of Energy now sponsors a crowd-sourcing initiative with the specific goal of jumpstarting citizen building technology innovation. DOE's JUMP program brings innovators together with national laboratories and private sector partners to help them test their ideas and secure funding.The impact that Internet of Things makers is going to have on Smart Buildings shouldn’t be underestimated. This IoT wave is more about empowering people than fitting within the existing enterprise department and practices. Its adoption curve could resemble the BYOD (bring your own device) movement that has transformed enterprise IT over the last ten years. Prior to BYOD, IT staff could hold to the policy of only supporting hardware and software that they selected, procured and distributed. But, when everyone from the CEO on down joined BYOD, IT departments eventually had to acquiesce and work with their vendors to figure out how to license applications and provide data security for a much larger range of devices and more mobile workforces. Building operations managers could be under similar pressure to change as occupants demand more personalized control over their temperature, lighting and other digital services made possible by this Maker Movement. John Petze and I discuss the roots of Edge-ifcation and data acquisition and computation functions as close to the data source as possible. As always John adds deep wisdom and understanding to my edgy rambling. Petze: I think a good place to start is by thinking about the IoT in general. The IoT is actually a distributed computing challenge. The reality is that it is not possible, cost-effective or desirable to transmit every piece of data from every IoT device to the cloud in order to gain value from that data. Go to Yahoo or Google or your favorite site. Look up a subject of interest. Do a search. Boom! There it is. The information you wanted. How did that happen? Did you upload and store all of the information to your computer first? To your cell phone? To your tablet? No. Is all of the information aggregated and stored on a single server or somewhere in the cloud? Did someone have to assemble and store it ahead of time in order for it to be to be searchable, accessible, viewable? Obviously, the answer is no. You request what you want when you want it. You search for what you want when you need it. You subscribe to news feeds that interest you. But you don’t try to aggregate it all in one place. Because you can’t. And, there is no need to. Yet most first-generation IoT data applications required all data to be sent to the cloud (or another central server) to be aggregated in order to be able to perform analytics and visualization. The reality is that you cannot bring every piece of data from hundreds, thousands, millions or billions of devices to a single server in order to be able to use that data, visualize it, analyze it, present it, and gain value from it. As the industry moves to more and more deployment of IoT devices and use of data-oriented applications this limitation has become very clear. Consider the example of a self-driving car. We can’t be dependent on sending data to the cloud before deciding to activate the brakes. That data analytics process needs to occur in the vehicle – at the edge. Yet other applications are better served by aggregating data on a central server. Consider how mapping applications collect and analyze GPS data from mobile phones to identify traffic jams and direct us to the best route to our destination. That application is better served by the cloud. Data analytics solutions need to embrace the highly distributed nature of the IoT and support that with a corresponding software architecture that enables computing to occur where it is most efficient, cost-effective, and reliable. That means an edge-to-cloud-software architecture. The self-driving car example highlights the “data latency” reasons we need to perform data analytics at the edge, but there are others. Why do property managers and building owners want top performing HVAC controls? They want their tenants or employees to be comfortable so that they can be productive. The closer a service provider can get to share in the success of their clients (obtaining productive employees), the more valuable their service will be. I believe it starts with tracking the real outcome of HVAC controls, occupant comfort, and creating a service level agreement (SLA) with direct compensation tied to the real-time measured comfort, translated into the improved economic efficiency ($/year) of the tenants in the space. If you are a property manager, why pay for a service agreement quantified by hours of a technician’s time? Why not make agreements quantified by what you truly value: Tenant comfort and productivity. This approach gives the HVAC/BAS industry a tremendous opportunity to address a valuable requirement by delivering Comfort-as-a-Service (CaaS). When re-reading it although it was originally pointed at Manufacturing it fits today's trends of Edge-ifcation and Edge-You-Cation and the Maker Movement. Start organically - They should map the local maker scene, survey relevant people and organizations, and then analyze the ecosystem looking for gaps and problems that require action. Make space for makers - Making requires a place to make, after all: a workshop or a studio, ideally one that is “open” for collaboration. And so local champions will likely want to host or help create or grow maker or hackerspaces in local incubators, accelerators, educational institutions, or design-production districts that can broaden access to the tools, collaboration, and learning needed for design, prototyping, manufacturing, and small-business growth. Pull in the private sector - Just as the Maker Movement is a source of talent and ideas for the industry, so is the private sector a source of resources and market knowledge for maker communities. Experiment with new forms of education and training - As a common cause for maker spaces, community colleges, universities, and employers, the movement is helping deliver more relevant workforce development skills. What do the new products of Edge-ifcation Meets Maker Movement look like? Like this device but many more are about to hit us. Indoor environmental control to determine health risks and reserves for productivity increase. Djinn sensor allows you to raise your team productivity up to 30%! It became even easier by monitoring your indoor environment conditions with the Djinn. Makers need meeting places of open source communities fast-paced, education-packed events like these. Haystack Connect 2019 is organized and produced by the Project Haystack Organization—an open source community of people and companies who share the vision that a connected, collaborative community can move the industry forward in ways that no single supplier can! The Project Haystack Organization is a 501(c) nonprofit trade association supported by its member companies, other organizations and individuals. The event builds on the inspiration and mission of the community to address the challenges of making smart device data work seamlessly across applications of all types. Technology continues to drive rapid change in smart devices, smart buildings, energy management, and operational efficiency. The most significant advances are driven not by a single company, but rather by collaboration and a community of companies creating open, best of breed technologies that work together through a range of open protocols and software interfaces. The work of the Project Haystack community addresses a critical gap that has limited the flow of data from smart devices to value-added applications, by making that data self-describing and easy to use. Good discussion here, ControlTalk NOW — Smart Buildings Videocast and PodCast for week ending October 14, 2018 features our how to get yourself “Edge-You-Cated” interview with Automated Buildings' owner and editor, Ken Sinclair. Midway through the interview, we are joined by one the top Master System Integrators in North America, Hepta Systems' Chief Information Officer, Jason Houck. Make your 2018 ControlTrends Awards Nominations today!